Well, we’ve been in Florence for exactly one year now - how time flies! Last May was a crazy, hectic time: we sold our house (and most of the furnishings) and sold the car - but still had an enormous amount of packing and moving to do. Not to mention the endless and often emotional choices about what to keep and what to ship to Italy. Once we arrived in Florence, we spent a month at Hotel Villa Carlotta and then moved into our apartment on Piazza Santa Croce the end of June. In August we were panic-stricken about whether or not we’d be able to stay in Italy (see earlier post) but everything concluded almost miraculously at the 11th hour. I enrolled in Italian classes, turned in my application for a Permesso di Soggiorno and was legally residing here. Yay. Then, in early March, after I’d squeezed in a quick trip to Seattle in February to supervise the packing of our furniture and beloved household items for shipment to Florence, my Permesso expired and it was the same crazy frenzy to enroll in more classes and apply to extend my PdS (Permesso di Soggiorno). When I went to the Ufficio Postale to renew it, I luckily faced the same nice clerk I’d seen in September - and he remembered me! And when I received mailed notice of my appointment to the Questura for fingerprints, etc it was dated for September - a very good thing! Now for the rest of our issues… It sometimes seems like we’ve been spending an awful lot of time and effort, not to mention money, simply trying to STAY in Italy!! - guigno, 2017 Since we spent a month at hotel Villa Carlotta, we became pretty familiar with Porta Romana, a part of Florence that doesn’t usually attract a ton of tourists. We visited the Boboli Gardens and the Costume Gallery in the Palazzo Pitti, had some wonderful food at Podere, found Muselab (and have become friends with Samantha and Giulia, designing sisters who also sew everything and source the fabrics), and many more shops, ristoranti, and cafes. Bob went to a Calcio Storico match, which is sort of a combination of rugby and boxing (!) during which the teams wear Renaissance costumes; I went shopping! - luglio, 2017 We moved into our apartment on Piazza Santa Croce and devoted more of our time to exploring the surrounding area: Sant’Ambrogio, Borgo la Croce, Piazza dei Ciompi, San Niccolo’. - agosto, 2017 This is when we were scrambling to submit official documents during a time when most of the city was on vacation. Ferragosto is a religious holiday in the middle of the month that gives people an excuse to take the whole month off. We discovered Easy Living (the beach on the Arno) and shakeratos. Also, agosto is very HOT! We only ventured out of the apartment in early morning or late evening and, the rest of the time, sat inside with the air-conditioning on and the shutters closed, wearing bathing suits. I read a number of books! - settembre, 2017 I flew to San Francisco for a few days on August 31st and then on to Seattle for what I hoped would be about a week. (silly me) But I sometimes felt like a hostage in my son’s apartment, waiting for the mail carrier who would deliver my passport with visa enclosed - which didn’t arrive until September 24th. I had major sticker shock in Seattle over the price of wine, groceries, and dining out - wow! It was so fun to see friends and family, but I missed Florence! Apparently, the weather in September was magnificent - it was definitely starting to cool off by the time I returned. - ottobre, 2017 I started Italian classes weeks behind the rest of the students and scrambled to catch up! With the weather cooling, it was the perfect time to get out and explore Firenze when homework was done. 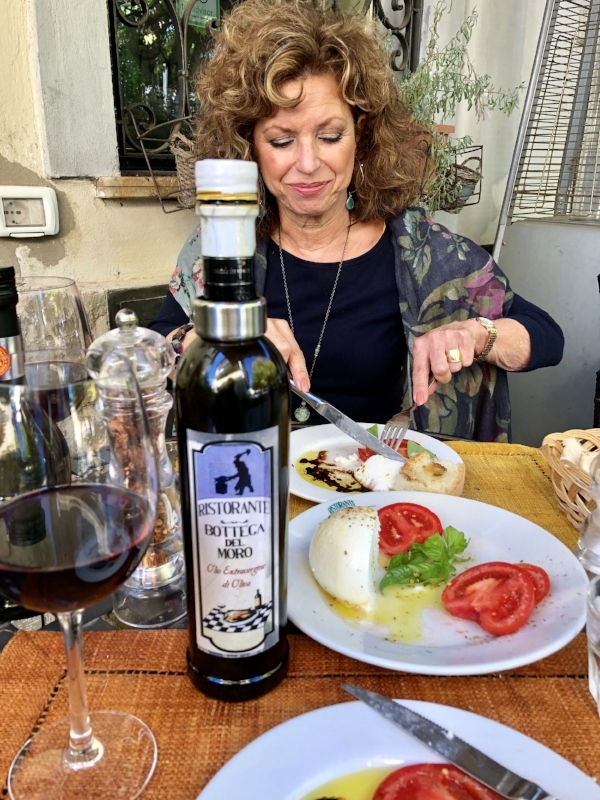 We took a bus to Greve in Chianti one day and had a delightful lunch at Bottega del Moro. Our friends, Angel and Heidi Diaz, came to Italy and we had a lively dinner together in one of our favorite places. By the end of the month, it was cool enough in the mornings to wear down jackets! - novembre, 2017 Brought even cooler weather, but not a lot of rain. So, it was perfect for more exploring. And, cooking in our minuscule kitchen. (Which included adapting French recipes for Italian ingredients) The Christmas decorations started going up around town in the middle of the month, which was festive. - dicembre, 2017 It was sometimes bitterly cold but, thankfully, clear. Our son, Nick, came to visit us for Christmas. We were still living in Piazza Santa Croce, at the time, where there was a wonderful Christmas Market set up for nearly the entire month of December. It was a conveniently close venue for a quick vin brûlée (mulled wine). And Bob bought a hat there! The man who NEVER wore a hat, now always wears one! Our friend, Beth Mountsier, came to visit her daughter and we enjoyed a dinner together. Samantha Rose had chirurgia di ginocchio (knee surgery) and spent most of the month convalescing. - gennaio, 2018 We found our new apartment (!) across the street from a beautiful Piazza (more of a park to us) that has a very Parisian feel. Maybe it’s because the very formal buildings are only 150 years old, instead of 500 years! And the piazza/park is well-tended and very beautiful - and filled with the sound of children playing, which I cherish. - marzo, 2018 We moved into our new apartment on March 1st and it snowed that day!! There wasn’t a taxi to be found, which is kind of important when you are moving clothes and boxes and you don’t have a car…. Also, I started Italian classes again and, this time, was not behind anymore - but a model student! - aprile, 2018 Our son came to visit! And our furniture arrived from Seattle! Our friends, Steve and Linda Cuddy, came to Florence to have dinner with us - oh, and visit their son who was studying abroad here - ha! Another fun time with friends! The trees in the Piazza across the street suddenly leafed out and it began to be quite pleasantly warm. And Samantha started running again after her successful surgery! - maggio, 2018 We hopped a bus to Fiesole and had a lovely Mother’s Day lunch. On a pleasant Saturday, our wonderful landlords took us to the family home in Montevarchi, just southeast of Florence about 40 minutes by car. They drove us there and even included Sammie in their invitation! An amazing place: beautiful home and pool, landscaped and fountained grounds, several large accessory dwellings, farmlands. It’s fabulous and —- for sale! After an incredible lunch in the country with them at Osteria dell'Acquolina, we wandered through their vineyards….. bliss. Finally, (technically in guigno, not maggio), we boarded the train to Arezzo, about an hour's ride from Florence, to peruse the monthly Flea Market (the first Sunday of every month and the Saturday before - I don’t know why they reference it that way, but everything I’ve read about it uses the same strange description - ha!) It’s not really a flea market, more of an Antiques Market, with equivalent pricing. Though there’s lots to see in this charming little city. We had a delightful (and delicious) lunch under the arcade at La Lancia d’Oro. And, our piazza is full of Linden trees that burst into bloom mid-month - the heady fragrance was intoxicating! We’ve discovered over the past year that Florence has definite seasons. L’invernale (winter) was bitingly cold, at times, but mostly clear and sunny. Estate (summer) is HOT. Pirmavera (spring) and Autunno (Autumn) are delightful. There are a lot of zenzare…. (mosquitos) all year round. A guest room at Montevarchi. LOVE the furniture! It's a work in progress and we’re constrained by it being partially furnished. But, with the addition of our own things, the apartment is coming together! Posted on June 21, 2018 by Jann Placentia.